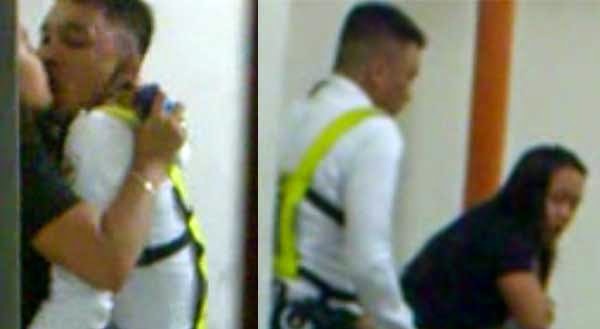 A scandalous video of a woman and a man wearing a security guard uniform inside an alleged mall parking area is making rounds on Facebook. According to a tipster, the viral video lasts one minute and thirty seconds. In it, the unidentified individuals are seen doing intimate physical contact, with most of their clothes on, in what appears to be a secluded part of a stairway. A quick Google search for the terms "mall security guard scandal" returned several results including download links. Some posts on adult sites date back to January 2014 although there's indication that a few blogs published relevant content only in late September. Most of the shared videos were labeled or titled with either "SM Mall security guard and saleslady video scandal" or "SM Megamall security guard and cashier parking scandal." The tipster, who noticed the video on Facebook over the weekend, said it has not been proven that the lovers in the scandal video were from the famous shopping store.